Patagonia Mussel is a joint venture between AMI Chile -the Chilean Association of Producers and Exporters of Mussels- and ProChile. Patagonia Mussel is joint venture between AMI Chile -the Chilean Association of Producers and Exporters of Mussels (www.amichile.cl)- and ProChile (www.prochile.gob.cl) launched in 2012 with the purpose of promoting the attributes and competitive advantages of Chilean mussels in international markets and increase the exports of this product, which has become a prestigious representative of the best of Chilean seafood. To achieve this goal, the brand Patagonia Mussel was created, bringing the main mussel exporters in the country, together. The creation of this brand also seeks to give a unique and distinctive identity to the product, based on its main attributes: its natural breeding in the cold and clean waters of Chilean Patagonia in the Pacific ocean, its superb taste, quality and texture, and its nutritional value and culinary versatility, which has attracted the attention of renowned chefs all over the world. Patagonia Mussel is a country sub-brand that has become a distinctive hallmark of food quality and safety standards of this product, for importers, distributors, retailers and final consumers that have been enjoying the quality and incomparable flavor of the Chilean mussel. The Patagonia Mussel Project was initially launched in Russia, in the year 2012. It was then implemented in Brazil, in the beginning of 2014, later in China -starting in 2015- and is currently being developed on the west coast of the USA. Currently, Chilean mussel exporters that participate in the Patagonia Mussel project in the USA and China, are: Orizon, St. Andrews, SudMaris and Toralla. The project is coordinated by an Executive Committee composed of the Chief Business Officers of these four companies, a General Project Manager, and a representative of ProChile. At the moment, the President of the Executive Committee is Jose Miguel Barros, from Orizon. The General Project Manager is JavieraFernández. St Andrews Representative: Pedro Pablo Ovalle. During the past few years, the export of Chilean mussel to the U.S. has increased considerably. Distributors and consumers of Chilean seafood have progressively valued the quality of the product and its unparalleled price/quality relationship. In the past few years, export of Chilean mussel to the U.S. has increased considerably. 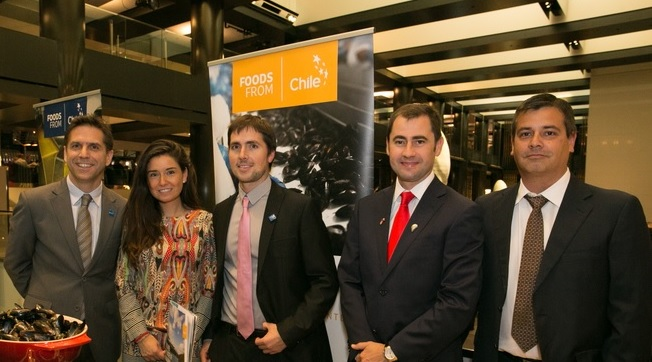 Distributors and consumers of Chilean seafood have progressively valued the quality of the product and its unparalleled price/quality relationship. Until now, most of the shipments have been to the east coast of the U.S. but soon we will launch a “Patagonia Mussel” brand campaign for the west coast, including a series of activities in foodservice channels, press, chefs, importers and distributers. We have found that consumers in the U.S. value healthy and nutritious food, striving for healthy lifestyles, and as a result increasing their intake of seafood. The Chilean mussel, aside from its excellent quality and flavor is rich, healthy, and nutritious, seafood loaded with Omega 3 and minerals. We would like that the Food Service and HORECA chains, importers, distributors, retailers and ultimately the consumers, to know the origin of the Chilean mussel and value the “Patagonia Mussel” brand, guaranteeing quality and health. We will work directly with chefs associations, renowned chefs and food critics in Los Angeles and San Francisco in order to create strategic alliances of mutual benefit, for restaurants and consumers to learn new recipes featuring the Chilean mussel.